Jack's little brother is growing! 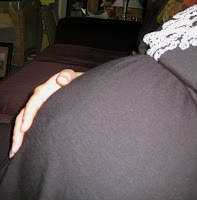 My friends, I'm 7 months pregnant and my brain is mush! I can't explain it! I go to write a post and it's like I can't type anything! It's like trying to talk and nothing comes out of my mouth...frustrating! So with that said, I thought I would take this time to share with you my favorite posts from Raising Jack with Celiac. This blog is very important to me and I would like to post more often! Upcoming posts - gluten-free fast-food options, best cupcakes ever, brownies in 1 minute, etc. So they are on my mind, but my mind can't seem to complete a thought! 9) Sometimes, You Have to Improvise! It was hard to choose, but I think I chose the ones that really helped me through the process of being a parent of a child with Celiac Disease - thus far anyway - Jack's only 5 yrs. old, so we have a ways to go! Make sure to click on the different topics above and stay tuned because I won't be pregnant FOREVER! ;) I'll still have mommy brain and sleep deprivation, but I will push through and keep writing!